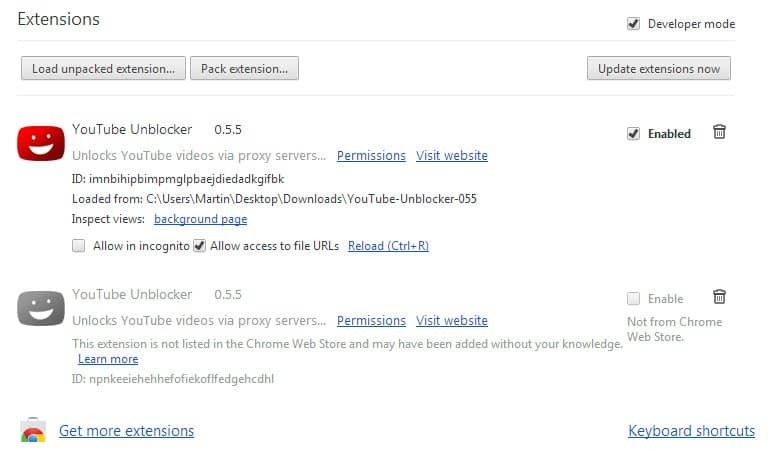 Google knows what is best for you, that's why Chrome Stable and Chrome Beta on Windows block extensions that have not been installed from the Chrome Web Store as of today. You will receive a notification stating "unsupported extensions disabled" with no option to re-enable the extension again in the browser directly. Why is Google doing so? According to the company, to make Chrome safer and protect users from malicious browser extensions that may have been installed without their knowledge. While the move will certainly protect some Chrome users by disabling malicious or unwanted extensions, it does punish other users of the browser who know what they are doing and have installed non-store extensions deliberately. Google's move may not be entirely altruistic considering that it gets more control over which extensions are allowed and which are not based on store's policies. Google's paternalism affects only Windows users who run Stable or Beta versions of the browser, and only extensions that are not listed in store either privately or publicly. The Dev and Canary channels of Chrome on Windows, and all browser channels for Linux, Mac and ChromeOS are not affected by the new policy. 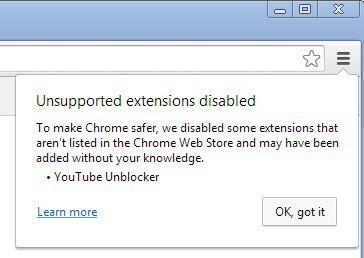 So what can you do if you have received the unsupported extensions disabled notification in Chrome but want to keep using extensions that have been blocked by the browser automatically? 1. Install Chrome Developer or Canary instead. The two channels are not affected by the policy yet. Check out our Chrome upgrade guide which walks you through the process. 2. Switch to Chromium instead. Consider this a development version as well. It is like Chrome, but without Google-specific features. 3. Switch to Opera browser. Since Opera uses the same core as Chrome, it supports the majority of extensions for the browser as well. Read how to install Chrome extensions in Opera for information on how to do that. 4. Use Developer Mode. Open chrome://extensions and check the developer mode option at the top. You need to extract the extension file (.crx) on your system for this to work. The easiest way to handle this is to download the extension again from the developer website. Right-click the extension again and extract it to a folder on your system. I'm using the free software 7-Zip for that operation. Now that you have extracted the extension, click on load unpacked extension and select the folder that you have extracted the extension files to. The extension will be installed and won't be removed on the next start of the browser. Chrome will display a "disable developer mode extensions" notification though in the browser, but you can cancel that to skip it. Note that it will display the message on every start of the browser. 5. Install using Enterprise policies. Consult this support page on the Google website for instructions on how to do so. On Windows, you can use the Group Policy for that or by pre-installing extensions via master_preferences. The easiest option to deal with the issue is to switch to Dev or Canary channels of the browser. This may not be possible all the time though, especially if you cannot or don't want to run beta versions of the browser on your system. Chromium is not an alternative in this case as well, which leaves Opera or installing extensions using the developer mode. Opera may lack features that you require, and developer mode displays the annoying notification message every time you start the browser. There is not really a solution that works without issues which is unfortunate. Google is now enforcing a policy affecting Chrome Stable and Beta versions that deactivates extensions not available in the official Chrome Web Store automatically. How about Chrome/Chromium forks such as WhiteHat Aviator as alternatives? Those should work as well just like Chromium does. Please be more specific about your comment…. How do you do that? Well time to uninstall chrome then. The extensions they just disabled were from microsoft and logitech websites. Why don’t they just protect the browser from extensions being installed without “their” (user’s) knowledge? IE closed the loophole allowing home page changing. Is Google actually dumber than Microsoft after all? (Dumb and Dumber :) Rather than focus on securing and protecting their Chrome browser from unauthorized alterations, they chose to tell the millions of supposedly free peoples what they can and can’t do, have? Better watch out, Big Brother is coming to town! my concern is that every time I open google I get the “unsupported……” message. OK, got it but it keeps coming back. Google is surely authoritarian in that. I do not need a nanny! Warn me if you want, but gimme the option! The best solution is to uninstall ALL GOOGLE software. If enough people do this, the loss of advertising revenue just might get Google’s attention. I have had to go to Firefox as my default browser because of this and have recommended this option to our 8000 clients. I too am sick and tired or reenabling Roboform, Google offers the free (for 30 days) at their store but disables the paid version. I am going to dump Google.